I LOVE LOVE LOVE NEW YORK!!!! ANY chance I can get up here I take it! I moved my son up here this weekend, he has an incredible summer internship – he is a smarty! I am so proud. I took him to his VERY FIRST Broadway show last night!!! 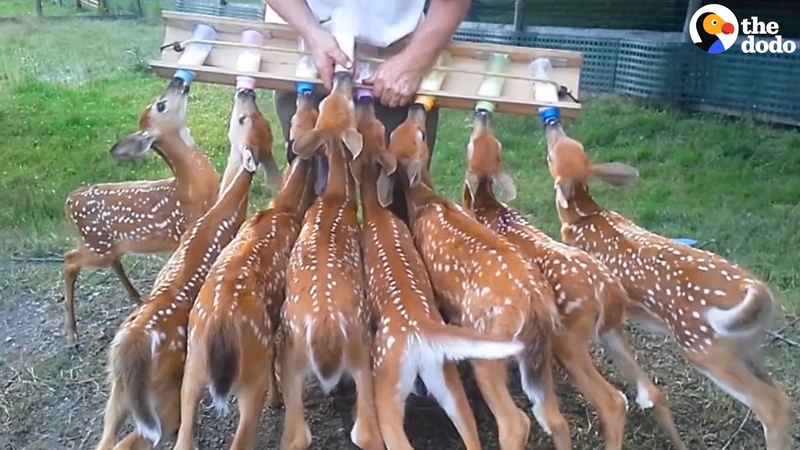 EVERY YEAR around this time – hundreds of baby deer are “found” and many are “rescued” unnessessarily. RUPERT – Photo by Jeff Moore. 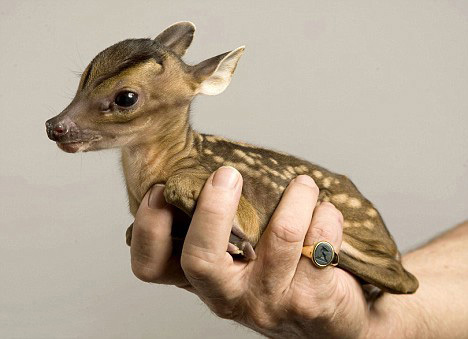 Once….I FOUND A BABY DEER. NO, NOT the deer above, the baby deer above is a deer named “Rupert” that was delivered via c section, 3 weeks early, after his Mother was hit by a car. This photo is so you can see how TINY the deer was that I saw. Slowly…..I stepped out of the car, and he just stood there…like a deer NOT in the headlights…just stunned and probably too tiny to even know what to do…slowly..very slowly…like still photographs connected into one movement..he began to turn away…and then he stumbled back into the tall grass. and disappeared….Instinct told me to leave him alone….and so that is exactly what I did. BABY DEER ARE BORN IN THE LATE SPRING. 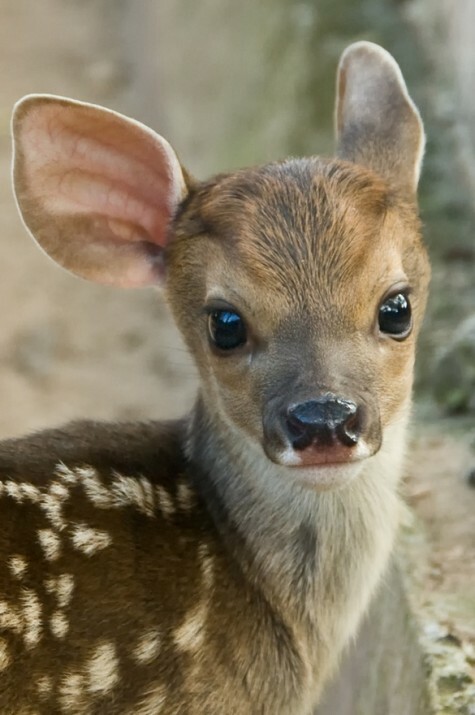 The AVERAGE FAWN HAS 294-306 SPOTS! Baby deer are born in the late Spring, when the weather is milder. 3. ALL OF THEIR PREDATORS – INCLUDING US – HAVE POOR NIGHT VISION. ALL of their predators have poor vision and see only in black and white and rely on scent to find their prey. 4. MOMMA DEER DOES HAVE SCENT. 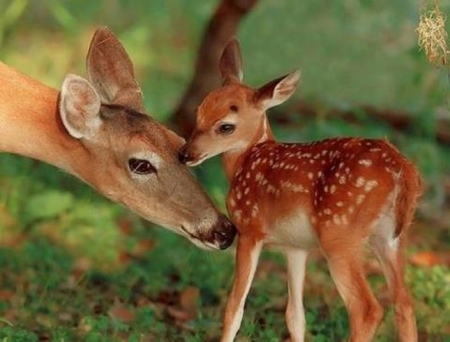 The Mommy deer DO have a scent ….they have the babies and then leave them, and ONLY come back to feed them and even consume their waste, as it has nutritive components for the new Mother. 5. THE JOB OF A BABY DEER IS TO SLEEP AND GROW AND GET STRONG ENOUGH TO THRIVE ON THEIR OWN. The babies mostly sleep and grow. This goes on for weeks, until the babies grow strong enough to keep up and run away from their prey.. SO IF YOU see a baby deer, ABSOLUTELY DO NOT TOUCH IT! 7. YOUR SCENT CAN BE A DEATH SENTENCE FOR A BABY DEER. Not unless you know for certain the mother is not coming back. YOUR scent will alert predators and be a death sentence for the deer. BABY DEER HAVE NO SCENT WHEN THEY ARE BORN AND THE MAMMA MAKES EVERY EFFORT TO PROTECT THEM BY NOT LEAVING HER SCENT ON THEM. 8. IF YOU ABSOLUTELY HAVE TO TOUCH THE DEER, SAY IF IT IS IN THE MIDDLE OF THE ROAD AND IN DANGER – WEAR GLOVES TO PROTECT IT FROM YOUR SCENT. A WILDLIFE RESCUE WORKER NURSES BABY DEER! 10. 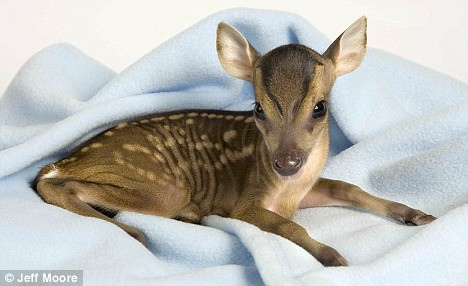 BABY DEER ARE INCREDIBLY PRECIOUS AND SO CUTE BUT THEY DO NOT MAKE GOOD HOUSE PETS. 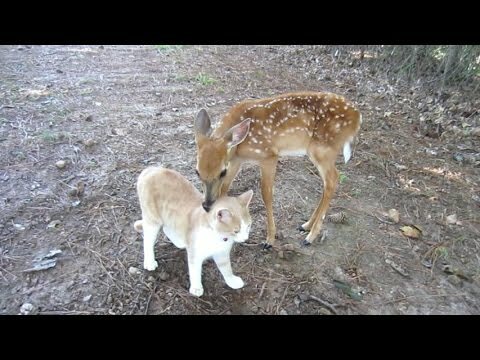 BABY DEER AND A KITTEN – THIS IS A VERY SWEET YOU-TUBE VIDEO – I HOPE THE DEER FOUND A SAFE HOME ONCE IT WAS GROWN. BABY deer grow to BE big big deer. AND yes, they can be domesticated and learn to live side by side with your family and your pets. I am sure we have all seen adorable examples of this, like the video above of the deer and the cat – on Instagram and Facebook. It is so sweet to watch deer and dogs playing happily together. BUT – eventually – they grow up and they have BIG deer instincts hard-wired into their DNA. They are not violent animals but if threatened Deer can kick and hurt you or your animals very badly. They do not fit very well on the sofa. They are better left to be outside animals and if you do save one – and you HAve no wildlife refuge available – try to encourage it to go back into the wild once it is strong enough to survive. So the good news is that most tiny deer you see are just fine. This is the way it is supposed to be. They sleep and Mama goes out, nourishes herself and them comes back to nurse them and removes all waste and signs and smells that could alert predators. Lesli! My family and I are planning a trip to New York in August and I just bought tickets to SpongeBob! Thanks for the hot tip! We are also seeing a couple of others. Can’t wait! I am so happy you got tickets. I am going to NYC in a few weeks with my best friend and our daughters and I got 4 tickets to SB – can’t wait to see it again! So happy the baby deer you found is with his momma. I live in CT and see a lot of deer in my neighborhood, so thanks for the info on what to do and what not to do if I see a baby deer. I am glad I could help. I was born in Connecticut. I love it there! Thanks for this wonderful post and these beautiful babies! The State of Virginia has a website listing of specialized wildlife rehabilitation specialists–you can search the url above by county to locate these dedicated people by their specialization (birds, turtles, snakes, etc). The Vet Hospital (Wellesley Animal Hospital in Short Pump, bless them) gave her antibiotics and fluids, and turned her over to the care of the specialist. Thank you for sharing such helpful info. I think the least we can do for all of these critters whom WE have displaced is to at least keep them safe. Thank you for sharing!! I have never seen a deer and I also don’t know anything about them. The natural instinct is so miraculous.